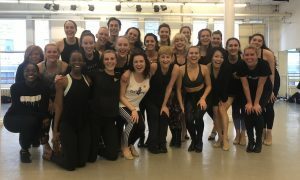 More than just a triple threat, Jared Grimes has explored (and excelled in) nearly every facet of show business: performing, choreographing, teaching, and producing. This spring, Grimes will take on a new adventure—starring in the brand new, star-studded, highly anticipated New York Spring Spectacular at Radio City Music Hall. “The New York Spring Spectacular is an amazing love letter to New York City,” explains Grimes. “It really represents what it’s like to live in the greatest city on Earth.” And who better to help tell this story than Grimes himself? A true New Yorker, Grimes was born in Jamaica, Queens and his mother was his first tap teacher. When his family moved to North Carolina, Grimes excelled in tap, jazz, and hip-hop along the competition circuit. He was even scouted by the North Carolina Youth Tap Ensemble and toured all over the world with the company. But after high school, Grimes found his way back to New York City where he received his Bachelor’s degree at Marymount Manhattan College. After graduating, Grimes almost immediately took to the stage. Some of his credits include tapping in After Midnight on Broadway, acting in “Fringe” on FOX, assisting choreographer Kenny Leon in Holler If You Hear Me, dancing for Mariah Carey, producing live shows like Broadway Underground and Run the Night, and teaching tap and hip-hop at Broadway Dance Center. In his career, Grimes has truly done it all: Broadway film, TV, producing, and teaching. “I actually don’t get nervous before I go on stage,” admits Grimes. “I do get anxious—very anxious.” Whether tapping on a subway platform, on a Broadway stage, or in the studio, it is clear that Grimes has to dance—and boy, are we glad! Jared Grimes in rehearsal for the ‘New York Spring Spectacular’ at Radio City Music Hall. Photo courtesy of MSG Entertainment. 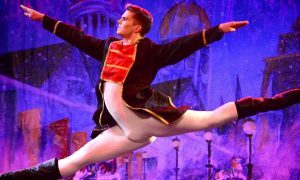 To learn more about the New York Spring Spectacular and to buy tickets, visit www.newyorkspringspectacular.com. 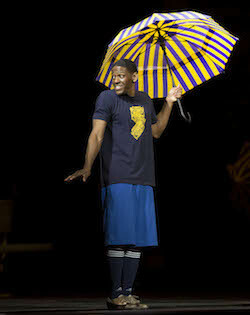 Photo (top): Jared Grimes in the New York Spring Spectacular. Photo courtesy of MSG Entertainment.